All TS Rigging's wooden blocks are crafted by hand in our workshop. Our “off the shelf” blocks have galvanised bindings and ash facings and come in two finshes and six sizes. Sheaves can be provided in white, black or grey (galvanised colour) Delrin/Acetal, galvanised steel or bronze. 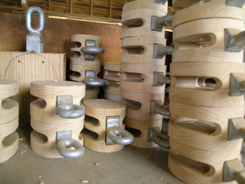 We can also supply wire or rope strops. Custom blocks can be made in special sizes and styles for specific roles. Fittings can include hooks, scissor-hooks, oval eyes, round eyes, bow bindings, swivel eyes. Blocks can also be supplied in teak or with bronze bindings if required. A repair and refurbishment service for old or damaged blocks is also available. Galvanised oval eye, ash shell, stainless steel pin, nylon sheave, varnished. Single or double, with or without becket, bow binding, hook. Yacht finish, varnished with brass caps over pin. With bronze binding and sheaves - special order, call us to discuss your requirements. Ash faced, supplied with or without rope or wire binding. Single or double, hard eye or soft eye, with or without becket. These include round eye blocks, treble blocks and scissor blocks made to order.